Edward C. Eastman - Davison, Eastman, Muñoz, Lederman & Paone, P.A. Ed Eastman is the firm’s authority on Real Estate, Complex Title Disputes and General Litigation. His department processes applications for tideland grants and leases, waterfront development permits and CAFRA permits. 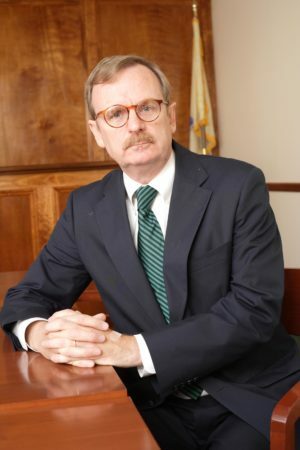 He has served as a lecturer for the New Jersey Land Title Institute, has authored sections of the New Jersey Practice Series on real estate law and is co-author of NJICLE book entitled, “Residential Real Estate Law and Practice in New Jersey.” He is the Past Chairperson of the Board of Consultors, of the Real Property Law Section of the New Jersey State Bar Association. Ed’s devotion to the practice of law is exemplified by the positions he has held and certifications he has obtained. The New Jersey Supreme Court has designated him as a Certified Civil Trial Attorney. He has been certified as a mediator by the N.J. Administration Office of the Courts. He has served as a Municipal Court Judge, a Municipal Prosecutor, as Assistant Monmouth County Counsel, Boundary Line Commissioner, Condemnation Commissioner, H.U.D. Foreclosure Commissioner and Master in Chancery. Ed is the Executive Director of the New Jersey Land Title Association (2000-present) and Manager of the New Jersey Land Title Insurance Rating Bureau (2003-present). He serves on the Title Insurance Advisory Committee with the N.J. Department of Banking and Insurance and the N.J.D.E.P. Advisory Committee on Onsite Wastewater Management, and served on the N.J. Supreme Court’s Advisory Committee on Attorney Continuing Legal Education. In 2006 Ed received the New Jersey State Bar Associations Legislative Recognition Award for his work on the proposed Adverse Possession Bill. On January 25, 2012 The Real Property, Trust and Estate Law Section of the New Jersey State Bar Association awarded its Arthur S. Horn Distinguished Service Award to him for his extraordinary contributions to the development of Real Property Law in the State of New Jersey. Ed received his B.A. from the University of Delaware and his J.D. from Seton Hall University School of Law. August 18, 2016 – Edward C. Eastman was again named to the 2016 Edition of Best Lawyers in America©, in the Litigation – Real Estate category. He has been selected for inclusion in the directory since 2010. Best Lawyers is among the oldest and most respected peer-review publication in the legal profession. February 22, 2016 – Edward C. Eastman, chair of the firm’s Real Estate Practice will be speaking on “New Jersey Tideland Claims” at a seminar sponsored by the Ocean County Bar Association. The program will take place at the Clarion Hotel and Conference Center in Toms River from 4:30 to 6:30 pm. Two NJ CLE credits will be offered. February 4, 2016 – Edward C. Eastman, chair of the firm’s Real Estate practice, will be giving a seminar at the New Jersey Society of Professional Land Surveyors 2016 Conference on February 4, 2016, at Bally’s Atlantic City. The topic will be “New Jersey Tideland Claims” and will review how the State’s mapping of the properties upon which the State asserts a claim of ownership arising from its assertion that it is now or formerly affected by tide has caused surveyors in the recent past to be masters of base photo maps and overlays. Determining the underlying basis for the claim, the rights of the upland and riparian owners, and the pertinent regulations, case law and statutes is as important in locating on the ground and depicting on a survey the results. A discussion of the common law, the Wharf Act and its repeal, riparian grants, leases and licenses, accretion, artificial works, limitations at law, statutory direction, legislative grants, the constitution, filling, lagoons, the reservation statement, preemptive rights, pierheads, bulkheads, exterior lines, gaps, gores, interior creek beds, extension clauses, the Tidelands Bureau, the Tidelands Resource Council and no fill clauses will make you want to stay clear of the water.